What if my dad had bought me Son of Satan #8 (Feb 1977) instead? This is a scan of the cover to the first issue of What If , dated February 1977. In fact, this is my personal copy. When this comic was released, I was seven years old, and I was at home, sick, suffering one of my several bouts with bronchitis. My dad, about to go grocery shopping, asked if there was anything I wanted while he was out, and I asked him to buy a comic book for me. Didn’t specify which one…pretty much anything would have been good to seven-year-old me. And What If #1, the very copy pictured above, is the one he picked out for me. Now, as a seven-year-old Mikester, I don’t really recall just how familiar I was with either Spider-Man or the Fantastic Four. I mean, sure, I suppose I knew Spider-Man from the cartoons, at least, and I’m pretty sure I’d seen FF comics once or twice…my cousin had a copy or two I remember perusing, and I know I inexplicably had a copy of this terrifying comic from just a few months prior, so I had some passing familiarity with the concept. And though I don’t specifically recall watching any, I’m sure I’d probably caught an FF cartoon or two along the way. 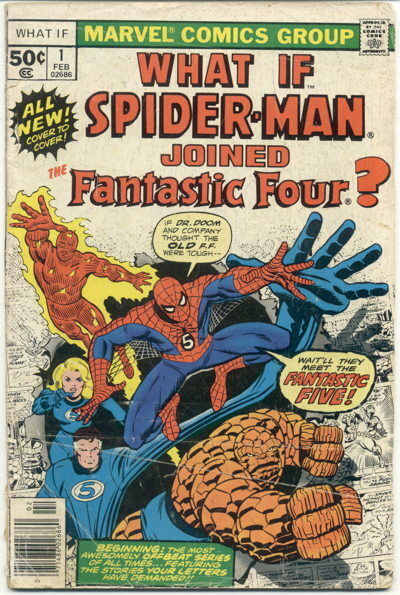 As such, this comic was more or less one of, if not the, earliest Spider-Man and/or Fantastic Four comic of My Very Own, and naturally it’s one that played with the established continuity of the characters. I got the concept, I’m reasonably certain. Repeated exposure to the old Land of the Lost TV show and its heady-for-’70s-kid-vid sci-fi concepts of parallel universes and time paradoxes and whatever probably helped prime me for the premise of this comic. The Watcher, the bald fella what lived on the Moon and watched things, would present to us, the bronchitis-afflicted seven-year-old readers, what could have happened if things just went a wee bit different in the Marvel Universe that we knew. Or, in my case, only barely knew, though this issue did a good job of explaining “here’s what really happened, and now here’s what we propose might have happened” and even my young illness-addled mind could grasp it. Helping matters is a one-page catch-up on the origins of the characters, which I’m sure I appreciated. …and of course plays coy as to whether or not this actually took place in another universe or not. I hadn’t read that particular crossover yet when I first read this first issue of What If , but I knew about it from ads I’d seen, and even then I knew that a character from Marvel Comics meeting a character from DC Comics was a Big Deal. I felt at the time like somebody was getting away with something by sneaking Superman’s blue-sleeved arm into this comic…and you know, decades later, looking at it now, I still feel like that, and it makes me laugh. Anyway, this comic sure packed in a lot of information about the Marvel Universe, introduced me to a lot of characters (like Namor and the Puppet Master), and through its emphasis on “this is different from what actually happened!” I was surprisingly not confused by what was regular Marvel continuity and what was alternate-continuity shenanigans. I ended up being mostly a DC Comics kid, as it turned out, but this issue of What If gave me at least a small level of comprehension of what to expect from the House of Ideas whenever I delved into their catalog. Oh, and those copies of the Origins of Marvel Comics and Son of Origins books, reprinting classic early Marvel stories and that I would eventually discover on my local library’s shelves, helped a lot, too. I didn’t end up following What If on a regular basis, but I would pick up the occasional issue as the whim struck me. I think a large part of the appeal was the sense of, perhaps, finality to some of the stories, or the idea that Big Things could happen here that couldn’t happen in regular continuity. Okay, “and then [x] dies at the end!” was a common theme, as was “What If [x] Never Became [Superhero Identity]” (answer: [x] becomes [Superhero Identity] anyway), but even still there was a sense of no one being safe, the threat of inevitable tragedy, the permanent change to the status quo, even if it’s just for that one-off story. It’s probably my primary nostalgia-trigger for comics collecting. Seeing a stack of What If s (like I did over the weekend, prepping more back issues at my store) reminds me of that rush of discovery, long ago, from picking through that first issue over and over again. It also pulls the old comic book sales trick of asking a question on the front cover, a question that’ll compel the potential reader to plunk down his 50 cents (or more, adjusting for inflation). The question’s built into the title of the series, which is brilliant. “What if Spider-Man kept his cosmic powers?” I don’t know…what if he did keep his cosmic powers? I must pay whatever the cover price is for that particular issue to find out! I’ve had a lot of comics from that time of my childhood fall to the wayside…read to pieces, thrown out, lost. But I held onto that What If , nearly forty years on. And it looks it: Comic Book Retailer Mike is aghast at the condition Young Comic Book Reader Mike let that comic fall into. Clearly, however, that was a comic that was read and loved, over and over again. Probably the one time I got top billing over Stan Lee. Also, I apparently required many different pens to scribe my name into this comic. And just to let you know, I’ve since learned to spell my name correctly on the first try. Usually. I really liked the one where Thor goes to Hyborea era, meets Conan, dies and Conan becomes the patriarch of the Asgardian Gods. Exiles also used the concept well… at least in the beginning. I would love to read of this strange alternative world where Mike Sterling’s favorite comic character is Son of Satan, not Swamp Thing, where he gets a job at a comic store in Fairfax, VA, and ends up convincing the president not to start a nuclear war! I love it when they sneak characters from other companies into cameos. Mike’s favorite Super Friends comic has the Hulk on the splash page! It probably won’t surprise you, but there was considerable debate in certain segments of fandom at the time as to “what Earth” the Supes/Spidey crossover happened on. At least one Marvel fan objected because Metropolis “wasn’t real” and this will never stop being funny to me. That Marvel Two-in-One with the Scarecrow and the Thing is one of my earliest comic book memories… there was a convenience store a few blocks from my house that sold comics from a vending machine, and I’m pretty sure I got it there. My very first comic at about age 6 was MIGHTY MOUSE IN OUTER SPACE. Thus are science-fiction writers born. But Mike: do you not agree that this is the very best issue of WHAT IF…? A young Mikester actually lived in Fairfax County Virginia when he was but a tyke. It is just by luck of the draw that he doesn’t work in a comic book store in Fairfax. My first comic was Uncanny X-Men #150. Instantly hooked. My favorite What If issue is, of course, What If Phoenix Had Not Died? I still have a soft spot for alternate universe stories where all my favorite characters are killed trying to save the world. So poignant! So you first comic wasn’t House of Secrets #92, when you were 1 year old? Didn’t Mike mention the best “What If?” a while back? Galactus as Elvis.